1. Little things mean a lot when you’re far from home. Even the smallest kindness. 2. Continuity helps. Contact throughout the entire deployment has a greater morale impact than sporadic contact. Sporadic has a greater morale boost than no contact. 3. Do what you can. I learned this lesson the hard way after taking on projects for him that were too big and/or not asking for help when I needed it. Obviously, these three things add up to the invention of Snail-Tweets. Or my version of it. What if I could send him a tiny bit of support for every day that he is deployed? Hearing your name at mail call is a powerful thing. However, if I sent letters every day I’d run out of things to say pretty quickly. But what if I kept it to 140 characters or less? What if, instead of tweeting online, I did it on postcards? 1. I will try to send him a snail-tweet every day. “Try” being the operative word in that sentence. 2. If I need help coming up with snail-tweets, I will ask for it. My daughter often has memorable lines. I bet my wonderful readers do too. It may even be more interesting if they’re not all from me. If I ask strangers, I could make their “handle” something descriptive like GuyAtHotDogStand. 3. I’ll number the cards so they’re easier to track. I’ve mailed things on the same day before and one will get there in two weeks and the other arrives months later or not at all. I know anything topical becomes historical when I put in a mailbox, but to me they’re moments. Being deployed, our troops miss so many everyday moments. It may be nice to get a few back. Urban Dictionary has Snail-Tweet defined as, “a conventional postcard.” I think my version of it is less conventional. So that’s my plan right now. Of course, like all plans related to the military, it is subject to change. Plus, you never know, there could be an outbreak of world peace. And those last 64 characters would be well worth giving up snail-tweeting for. This entry was posted in Care Packages & Letters and tagged deployment, ecouragement, ideas, Military, moments, postcards, snail-tweets, Soldier, Twitter by Gina left the mall. Bookmark the permalink. Thank you for thinking of those that serve and their families. Thank you for praying for them and for peace for us all. Love it! This is such a great idea. I know how good it feels to have any kind of mail. The postcard idea makes it even more fun! Thanks! I hope he likes it too! Great idea. God they are lucky to have you. Another idea one day – is for you to send some mail to an unnamed soldier at the same address – and just tell them to give it to someone who never gets mail – so he can feel good too!!! Thanks CJ! I feel like I’m the lucky one 🙂 And I like your thinking! Actually I’ve done it a few times whenever someone has mentioned that others in their unit were not getting mail. I’d send to one specific person and include in their package a few extras to pass out. When I was deployed and we would get letters from school children, organizations and anyone who cared that we were there, it would feel so good to read their words of support and encouragement. I am still friends with someone who sent a beautiful Christmas card to troops while I was deployed to Bosnia in 1998. We still write and I’ve even visited her a couple times. Thanks Gina for supporting our troops. Thank you for your service. I’m happy you got to see how much others cared when you were in Bosnia. I think it’s wonderful that you are still in touch with your pen pal. I’ve kept in touch with some of the troops I’ve written to and met a few in person including this soldier and his family. It’s always something special. Love this idea, Gina. So simple but so meaningful. Thanks! And congrats on getting your stop mail date and being one step closer to homecoming!! Another wonderful idea, Gina. That way your soldier will know he is always in your thoughts. Thanks NP! I think when you’re far from home, cut off from so much, and in a difficult and dangerous environment, it’s easy to feel forgotten. Hopefully my snail-tweets will get the message across that he is not. 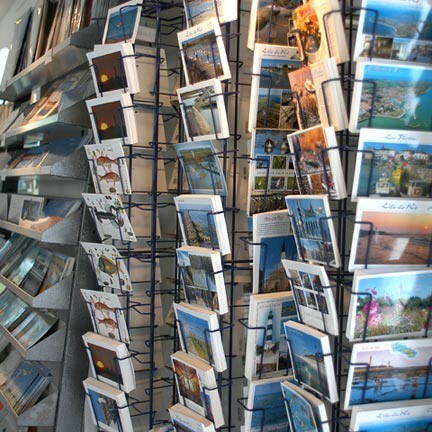 Postcards are such a fun blast from the past; they’re the perfect vehicle for slow-tweeting. I’m going to borrow your snail-tweet idea. I travel a lot, so I was already picking up postcards as souvenirs, but now I actually get to use them! Thanks so much for reading and for your kind words. Like you, I’ve wound up supporting troops in a variety ways. The more I learned, the more I wanted to do. While my daughter Sofia accidentally kicked off the “random event” that started me on this journey (https://ginaleftthemall.com/2012/08/07/a-sailor-wrecks-my-indifference/) what’s funny is that I thought the same things as you– “Man…they’re going to get bored fast” with all my kid stories..lol. I’m happy to say it hasn’t turned out that way at all. And yes, your continued responses are an excellent sign! I’m sure our young men and women who serve and excited to hear from an awesome 24-year old. Glad you like the snail-tweet idea and that you will put your souvenirs to very good use 🙂 Thank you for all you do!! I like this idea. Sometimes it’s hard to think of what to write but a short snail tweet might just do the trick. I think I can do this. Hi Krishna, my name is Kyndal. I am a big fan and a big supporter and prayer warrior of the troops. I saw your post here on Gina’s blog, I saw in your post that where you and your unit was when ya’ll would get letters it felt so good. I hope you won’t think I’m crazy, I would just like to tell you from the bottom of my heart “Thank You” for your wonderful service to our country, your service to our country is very much appreciated!! !